Yesterday I participated in the Women's March on Washington-Portland. It was an awe inspiring experience. At first I wasn't sure I was going to participate. The night before, on inauguration day, protesters downtown had been met with riot gear and tear gas. I was concerned about my safety and the safety of others. Although the intent of the march was peace, one never knows when those with alternative motives will come and change the trajectory. The march was peaceful and, considering there were nearly 100,000 people there, went smoothly and without event. I am so glad that I marched. I have so many and so much to march for. Let's be real....I am a white cis-gender woman who has led a decent life. Many would look at me and say that I should step aside but I won't. I won't because there are so many in my life that deserve better, so many that are under threat from outside forces For them I march. Saturday, I marched. 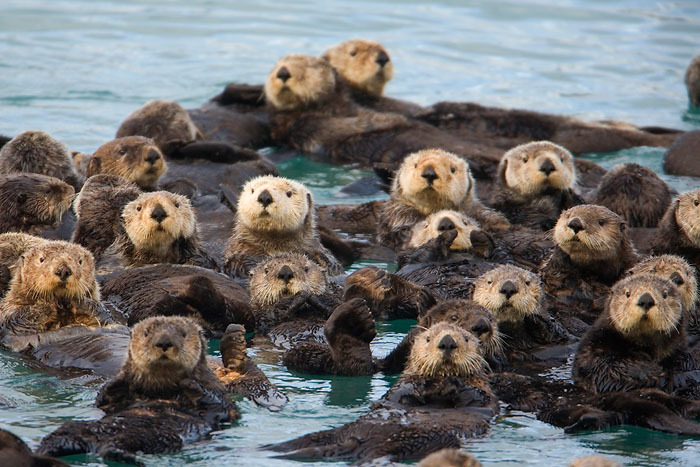 Like otters, we joined together and made a raft of bodies that was unbreakable. A wall of men, women, and children shoulder to shoulder. People helping people hurdle dividers, lifting strollers over barriers, making sure that everyone felt safe and protected. Like otters, we held hands holding one another. This raft that we're building will need to hold us safe for the next four years and possibly beyond. I am building my raft of protection for those I love. For those who are important to me. My raft will protect my daughter, who during the course of her life has been sexually assaulted, been in a controlling relationship, and told that he words didn't matter because she was a woman. My raft will be built to protect my students who wear the hijab, who are treated as less than their peers because of their faith. My raft will be built for my students who have come from refugee camps, who packed up in the dark of the night and fled. For my students who left crippling poverty and war conditions. My raft will be built so that each of them can build a life and live in a country that does not judge them by the color of their skin, their faith, or their country of origin. My raft is built to protect my son, who has survived well beyond what was expected. Doctors didn't give him much of a shot, but quality heath care, supplemented by the Affordable Care Act, has given him more than one shot. His (sometimes) frail body, has fought endlessly against diseases that have threatened his existence. Doctors have put their heads together and have been creative to restore his sometimes battered body. He is one of many children and adults whose disabilities make them a target, who are treated as less because of their wheelchair, their inability to talk, their bodies that are broken or battered. These amazing humans are looked at as if they have nothing to offer, while I know that within those bodies are amazing humans just waiting to show what they've got. My raft is built for all of those who are not being heard. Women of color who keep being pushed aside as if their strong and powerful voices don't matter. Women who are the center of their communities who are building their own rafts, trying to keep their communities afloat. Women who are working to keep their children safe. Who have to explain to their beautiful sons and daughters that when they walk down the street they need to be aware of their surroundings, when they drive they need to keep their hands visible, and be careful that they don't talk too loud around law enforcement or act erratic. These women, powerful and amazing, is who my raft is built for. So, when people wonder why I am out there marching I say that I march for those around me. The otters in my community who deserve to feel safe and protected. We join together, wrapping our legs around the kelp and joining hands. Together we will hold strong and do our best to keep each other from bashing against the rocks. If we hold tight, we can make it through the danger, but we can only make it together. I won't let go....this time it's far too important. Together we march, together we build, we will survive...together.